My 10 year old was petrified of dogs She would shake and become hysterical if she even passed one in the street, and we could not even think about going to parks or to friends with dogs. It didn’t matter if the dog was a tiny ball of fluff , she was terrified. We had tried a lot of different things to help her , including a number of therapies and two lots of hypnosis and none of them made any difference at all. After two sessions with Lauren , I could not believe my eyes , when we brought in Lauren’s dog Whisky, and she was actually holding the dog and feeding her. Since then, she has been hugely improved with all dogs and is able to go to parks and to all of her friends houses who have a dog , without any problem at all. 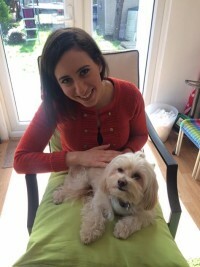 I had been at the point of giving up on any therapy ever working with my daughters fear as it was so deeply entrenched but Lauren ( and Whisky who is a particularly cute dog ! ) managed to save her from a lifetime of this fear. My 12 year old daughter Leah had been afraid of dogs for most of her life. In the last year, the fear had become worse. For example, when we went as a family to a park, she would spend most of the time holding onto the baby’s buggy, hiding behind my husband or I, trying to make us avoid walking too close to a dog or walking fast as soon as one was walking in our direction. It was draining on the whole family and created unnecessary tension. At that point we realised my daughter needed professional help to overcome this fear. We had two sessions with Lauren, and by the end of the second one, Leah was actually holding and cuddling Lauren’s dog – it was unbelievable! Leah now feels so much more confident when she goes out and we will be forever grateful to Lauren for her help. She was so gentle, patient and understanding and Leah engaged with her from the start. Thank you Lauren!! 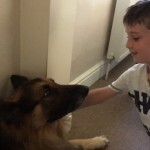 “I recently brought my 9 year old son to Lauren to try and conquer his fear of dogs. Over the past few years, he became more and more terrified of dogs to the point where he refused to visit friends and family when they all got puppies. He felt excluded and paralysed by fear. It was really distressing to see him so nervous and anxious around dogs and not know how best to help him. The situation only seemed to worsen over time and we had to stop exposing him to dogs completely. Luckily, a friend recommended Lauren and I can honestly say, after having just a few sessions with her and Whiskey (the most beautifully trained therapy dog) it has made the world of difference to our son. He will now visit his friends again and I can see that his fears have greatly diminished. I’m hopeful that as time goes by, he will feel more and more confident around dogs and he will remember the tools Lauren imparted. Our family is exceedingly grateful for the positive change she has made. I would highly recommend Lauren to anyone with any kind of fear / phobia issues. for her fear of dogs, Lauren showed us the utmost kindness and understanding as she showed to our daughter during her sessions. Lauren explained everything clearly before during and after the sessions. Our daughter is now free of her fear of dogs and we are most thankful to Lauren as the fear was crippling our daughter each time she saw a dog in the street. We highly recommend Lauren and salute her for her incredible patience and understanding which which we are exceptionally greatful. Lauren you should continue to go from strength to strength. I took my almost 8 year old son to see Lauren after a recommendation on Facebook for www.fear-busters.com. As long as I could remember he has been petrified of cats and dogs. His fear would stop him going to people’s homes with cats or dogs (and other pets) and he would often become extremely anxious and tearful if we ever did need to go to friends or family with a dog or cat. Mostly they would have to move their pet to another room and if the dog came into the room with my son, he would cling on to me and I could feel his heart racing. During the last couple of years, he has been upset about his fear and had said to me his wished he wasn’t like that. After my initial first chat with Lauren, she warned me that my son might want a pet dog after her sessions! I showed my son Lauren’s website with other testimonials and he asked if she would make his fear go away and I said I thought she would be able to. He even asked then whether one day he might be able to have a dog. At our first session, Lauren used various techniques to identify where he felt his fear and techniques to help him deal with his fear (which he could practice at home). It was fascinating from a parent’s point of view to listen to some of her insights. At the second session, Lauren felt that actually for my son, it was tricky for him to talk about his fear theoretically, so she asked if she could bring in her dog, Whisky, which amazingly he agreed to. Having been practicing the techniques in the week and Lauren working with him for 20 minutes at the start of the session, my son was able to feed Whisky, hold him on his lap, stroke him and enjoy it! He genuinely had no fear. It was like witnessing a different child and to see his joy at being able to do it was simply wonderful. As soon as we left he said he wished we could stay for another hour! At the final session, he met Lauren’s other dog and he fed and stroked her too. I think what has been absolutely fascinating to watch is how quickly his fear was released. He found the techniques a bit weird and strange to begin with as they were completely unfamiliar but we agreed that really it didn’t matter how it works but the fact that it does. 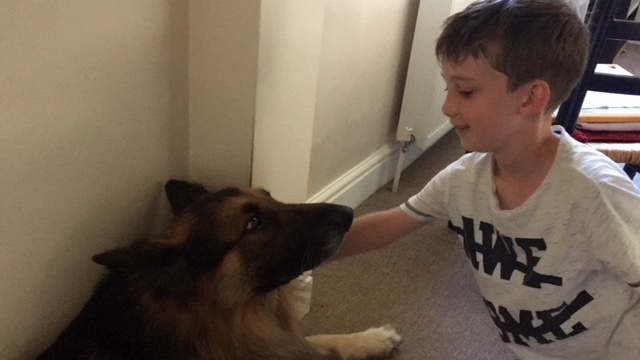 “Two weeks after Ethan’s last session with Lauren, we went to visit Ethan’s grandma who has an Alsatian called Harley. He’s always been terrified of the dog and my mother-in-law has needed to keep him in another room most of the time and whenever he did come in, Ethan would feel very panicked. I was honestly a little nervous about how Ethan would react. He had loved Whiskey, but for my logical mind, I figured Whiskey is very cute and small but Harley is big and less cute! So, would all the techniques Lauren had taught him work for all dogs? Had his fear genuinely gone? I’m 32 years old and have had a debilitating phobia of dogs ever since I can remember. I would do everything to get away from dogs, including leaving my new born baby in the middle of a road, jumping off a cliff and refusing to walk down the street on my own. My husband, relatives and friends can tell a hundred stories about the embarrassing thing I have done when I have seen a dog. To make sure I rarely saw a dog I would refuse to go to parks, beaches or outdoor areas for the last 16 years – I have 3 children so this hasn’t been great for them. Over the years I had tried everything to get rid of the phobia including NLP, counselling, hypnotherapy, psychotherapy and even getting a puppy but nothing worked. Until I saw one of Lauren’s posts on Facebook and although I was skeptical I thought I would give it a try as I had nothing to lose. I had two Skype sessions with Lauren, who understood my situation straight away. Even a few weeks after the sessions I hadn’t seen any dogs so I didn’t know if it had worked. Then I visited Lauren and her dog. She did a session with me with the dog in the room. At first I was terrified and only agreed if the dog was being held tightly but by the end of the session I was able to stroke it, then let it run freely around me, something that had never happened before. All the fear seemed to have disappeared. I went straight to the park to see if it worked with other dogs and for the first time I was able to walk in a park on my own without shaking with fear. It’s only been a few days but it’s hopefully changed my life forever and given me my freedom. I’m a mum of 3 and as long as I can remember I was always scared of dogs and any animals. I didn’t like to sit outside cafes in case a dog will walk pass. I didn’t like going to zoo or farms with my kids it didn’t interest me and when we did go I never ever used to feed the animals and didn’t let my kids feed them either as I found it scary. I wasn’t enjoying going to parks. Whenever I saw a dog I’d run a mile. I always watched my back to see if there is a dog behind me. If I saw a dog coming towards me on the street I would cross the road and my heart would start racing. It’s started to bother me lately because I felt that I’m passing it on to my kids and it almost stopped me from cancelling a trip with a few members of my family that have a dog. I decided enough is enough I have to get over the fear. At first I was really embarrassed even to ask around for recommendations. I was scared ppl would think I’m crazy. 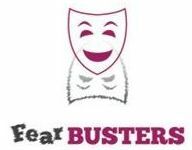 I felt like I’m the only one who is scared of dogs.But thanks to a friend who recommended to me about Lauren from FEARBUSTERS after only 3 sessions she changed my life.she was so calm and understanding. I got to know her cute little dogs and I’m in love!!! I never thought I would say cute about dogs. Since that day I’m looking forward for the opportunity to meet other dogs. I’m relaxed when I’m walking on the streets and feel like I achieved something in my life as it didn’t seem like it was going to happen!!! I would like to highly recommend Lauren to you as she could help you too!!! Lauren came highly recommended by a friend to go as I was petrified of dogs. As soon as I arrived at my first appointment I felt comfortable and relaxed. as I had been through a huge tragedy it came up almost straight away and with Lauren help I was able to look at things differently and my life feels a whole lot lighter! After dealing with that Lauren went on to deal with my fear of dogs and after just a few sessions I was happily holding her dog. So here I’m a few months after I met Lauren. Which I can say my life has changed since then!!! After being scared of dogs since I know myself, suddenly a walk in the park feels so nice. This feeling of literally having heart attack when seeing a dog is finally gone!!! i can finally say dogs are cute! Which i never thought I would say ever. After spending two weeks in same apartment with family members dog. I was petrified before we went I kept thinking what if he suddenly walks in my room etc…..or what if he jumps on me….? but with Laurence’s help I ended up enjoying the dog so much. My kids loved him we even had family pictures with him which I keep pinching myself to see if it’s real as I never thought I would stand next to a dog without jumping or forcing myself to breathe and stay calm or even stroke or say cute about a dog! But these times as gone now and it feels amazing not being scared anymore! Not only that, Lauren had taught me how to positive think!!!! Which helps with day to day life! So if you are scared of anything or just need to learn how to calm yourself down with any situation. Don’t be ashamed of it and help yourself by getting in touch with Lauren! I cannot recommend her enough!!! !